An orchidarium at Tipi (5km from Bhalukpong) is the Botanical paradise of the state. About 300 species can be seen in the flora-glass house. An orchid Sanctuary at Sessa (24kms. from Tipi on the way to Bomdila) spread over an area of 100sq. Over 2600 Orchids representing 80 species have cultivated in natural surroundings. Scenic beauty, high water falls and the bank of river Kameng surrounded by ever green forests are photographer's delight. The meandering Kameng river provides excellent opportunity for white water rafting and has been th Angler's paradise for long. At a height of 8,500 ft., Bomdila is the headquarter of West kameng District, the land of Monpa, Sherdukpen, Aka (Hrusso), Miji and Bogun (Khawas) tribes. Bomdila also offers a Bird's eye view of Kangto and Gorichen Peaks (highest peak of the State) amidst the Himalayan landscape and snow clad ranges. Monasteries and Hot Springs. Apple and Kiwi Orchards. National Yak Researchand Breeding Centre at Nigmadung. Sheep Breeding Farm and Sangti valley Siberian Black Necked Storks visit during winter (nine kms, from Dirang) are the worth visiting places. Sela Pass is on the way to Tawang, the world's second highest pass at 14,000 ft. height, which runs through a small ridge and along the Paradise lake. The War Memorial raised pay homage to Jaswant Singh, Mahavir Chakra awardee (Posthumous) of 4 Battalion Garwal Rifles is a place where patriotice motions of all Indians find a natural expression. Tawang (183 kms from Bomdila) (Tawang Monastery, Gompas, Urgelling Monastery, P.T.TSO Lake,Sangesur Lake). Nested in the lap of Himalayas at 3,500 meters above sea level lies Tawang-the beautiful land of Monpas. The legendary 17th century Tawang Monastery, perched a top a hill, over looking the ridge and surrounded by thick clouds, entices the spiritual part of even he at hesists with itsethereal peace. ITA FORT, the name Itanagar, capital of Arunachal Pradesh, is derived from the historical fort called Itafort situated in the heart of the town. It is said that more than 80 lakh piece of bricks were used to build this fort. Gekar Sinyi (Ganga Lake) is situated in the foothills of the Himalayas is a unique piece of the capital, Itanagar. The lake locally known as Gekar Sinyi (Confined water) abounds in natural beauty. Other important places to see are Jawaharlal Nehru State Museum, Craft Centre, Emporium Trade Centre, Donyi-Polo Centre for hearing impaired, State Forest Research Institute, Zoo, Nerist, Arunachal University, Central and State Libraries. 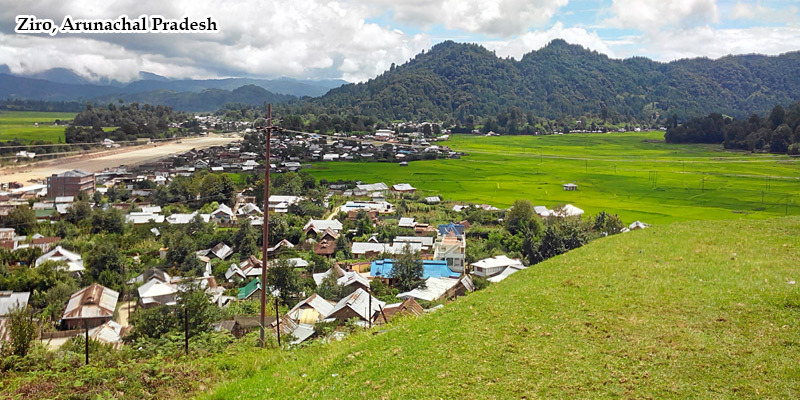 Situated at an altitude of 5,000 ft. (approx), Ziro is a beautiful plateau and the district headquarter of Lower Subansiri district. Other places of interests are Tarin Fish Farm, Parsi-Parlo archaeological site, Orchid Garden and Pine & Bamboo groves. Daporijo is the district headquarterof Upper Subansiri district. Menga Cave give immense satisfaction to the believer of Lord Shiva and it is a famous holy place of worship drawing large number of visitors and pilgrims specially during the Makar Sankrantiand Shivaratri. The Subansiri river is ideal for river rafting, angling and picnic. Along, the headquarter of West Siang District situated on the south bank of river Yomgo, is an ideal place for trekking, hiking and angling in the river Yomgo. Patum Bridge over Yomgo river, museum and Donyi-Polo Dere are the places of tourist attraction. The headquarter of East Siang district, Pasighat is situated on the bank of river Siang that is known as Brahmaputra in Assam and Tsangpo in Tibet. River Siang is ideal for angling and river rafting. If you throw in your bait in any where in the water you could jolly well be pulling a Golden Masheers, a trout, a Labeobata or even Sehizo trout out. This circuit begins at Roing, the district headquarer of Lower Dibang Valley District. Bhismak nagar, Salley Lake, Mehao Lake, Mayudia, Anini. Mayudia, a unique hill resort, is 56km from the district headquarters Roing. It is situated at an altitude of about 7,000ft. amidst lofty hills, lush green forests and breath taking landscapes. Thick cover of snow adds exquisite serenity to the place. It is the oldest archaeological site of Arunachal Pradesh. It can be called a 'Hill Fort' made of burnt bricks. The fort is situated at 29kms. South East of Roing. The ruins of the Hill Fort dates back to circa 12th century A.D.
Forms a part of the Mehao Wildlife Sanctuary. It is situated at a distance of approximately 17kms from Roing.It is a vast lake covering an area of about 4sq.km. Nearly 80kms to the north-east of Tezu, the district headquarter, lies Parsuramkund. Here, according to the legend recorded in the Kalika Purana, Parasuram washed away his sins of killing of his mother, in the waters of Brahmakund. On Makar Sankranti each year, a mela is held at the kund where thousands of devotees throng their way to wash their sins away. War Memorial at Walong as amark of respect and remembrance to brave Martyrs, who were laid their lives during Chinese aggression of 1962, the army authorities have constructed a gigantic War Memorial at Walong. Dong valley is the place where the first Sunrise in the country is witnessed. Other important places to see are Glow lake, Hot springs, Craft Centre, District museum, Buddhist temple etc. River Lohit is ideal for rafting and angling. Is the only park in the country where four of the felines are found (the tiger, the leopard, the snow leopard and the clouded leopard). Another unique feature of the parkis that the park covers wide range of altitude from 200mtrs. To 4500 mtrs.